I’m not here to quibble over semantics, but not EVERYTHING someone does to a grave is just automatically desecration. 1. Burying a second body: My introduction of a separate, unrelated body to a grave plot is, if anything, a celebration of that grave. It is a testament to the quality of a grave that it can demonstrably accommodate not one, but two whole human bodies and still grant the same peace and stillness to anyone paying their respects. If you think that dishonors a person’s final resting place, that says more about you than it does about me. 2. 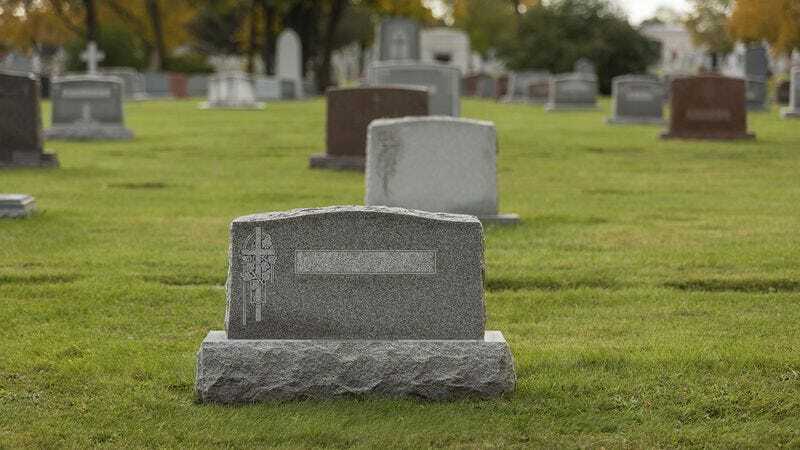 Carving a checkmark into a headstone: Having personally dug up and checked in on the contents of a certain grave, I consider it a public service to let the dearly departed’s loved ones know that their friend or family member is still right where they left them. A simple checkmark, gouged in with a humble chisel, puts any lingering suspicions to rest and provides peace of mind to visiting mourners. I can see no other way to interpret that. 3. Hosting an intimate barbecue: Is a low-key graveside cookout with a charcoal grill, a Styrofoam cooler, and a few close friends potentially distracting to nearby cemetery-goers? I’ll concede that it might be a little disruptive to the living, but in no way does it defile the memory of the deceased (as some have loudly claimed). A verdant, spacious graveyard is the perfect locale for Sunday afternoon grilling, as old friends crack open beers and nosh down a few dogs while contemplating this roller coaster ride we call life. If that’s “desecration,” I hope someone “desecrates” my grave when I pass. 4. Igniting a controlled burn: I won’t pretend my intimate barbecue didn’t take a toll on the health of the cemetery grass. That’s why, as a responsible individual, I took on the task of rejuvenating the affected areas with a controlled burn. This one definitely flirted with desecration after a few headstones got scorched when the wind shifted suddenly, but ultimately, a lusher, greener cemetery in the long run is more important, and this has to be considered a relative good. 5. Replacing some headstones with much larger headstones: How anyone could criticize me for this blatant improvement is simply beyond me. 6. Hiring a man named Sidewinder off the internet to bang a pipe against a headstone: For basically pocket change, this remarkable individual I found on Craigslist has kept every part of the cemetery in earshot completely clear of birds, teens, and potential vandals, thanks to his vigorous arrhythmic banging and clanging. Despite this helpful service, the town clerk still had the gall to send me an invoice for damage and a strongly worded letter that uses the word “desecrate” no fewer than nine times. This is the thanks Sidewinder and I get. Unbelievable.